Recommendations for The Good, The Bad and The Ugly. With less time for the gaming aspects of the hobby, I still want to paint from time to time so have ideas for some dioramas to try my hand on. Painting skills need to improve muchly . Anyhoo, any suitable suggestions for the iconic Blondie, Tuco and Angel Eyes? Preferably 28mm and with no conversion as I haven't really done any of that (except a head swap or two). "Who knows what Evil lurks in the heart of men?" Re: Recommendations for The Good, The Bad and The Ugly. 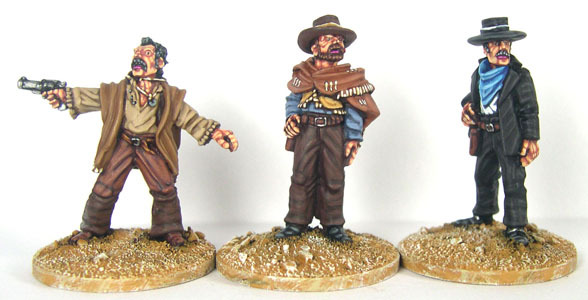 Artizan Design do the trio in 28mm and very nice they are too. Knuckleduster do them in their 32mm range, although I only recall seeing a Tuco sitting in the bathtub firing his revolver and Blondie may only have been available as a Kickstarter add on. Onira(?) Miniatures do a vignette with Blondie and Tuco at the graveside, but no Angel Eyes. You can also buy all three in 40mm via the old HLBSC range, can't think for the moment who sells them now. "There are two kinds of people in this world, my friend. Those with Blondie, Tuco and Angel Eyes... and those without." Thank you very much for the recommendations. Certainly worth thinking about. Artizan they call them AWW001 - Ill Buono,Ill Brutto,Ill Cattivo see: https://www.artizandesigns.com/prod.php?prod=1012 they are well priced and available in Uk they also do some lovely banditos and deperados.